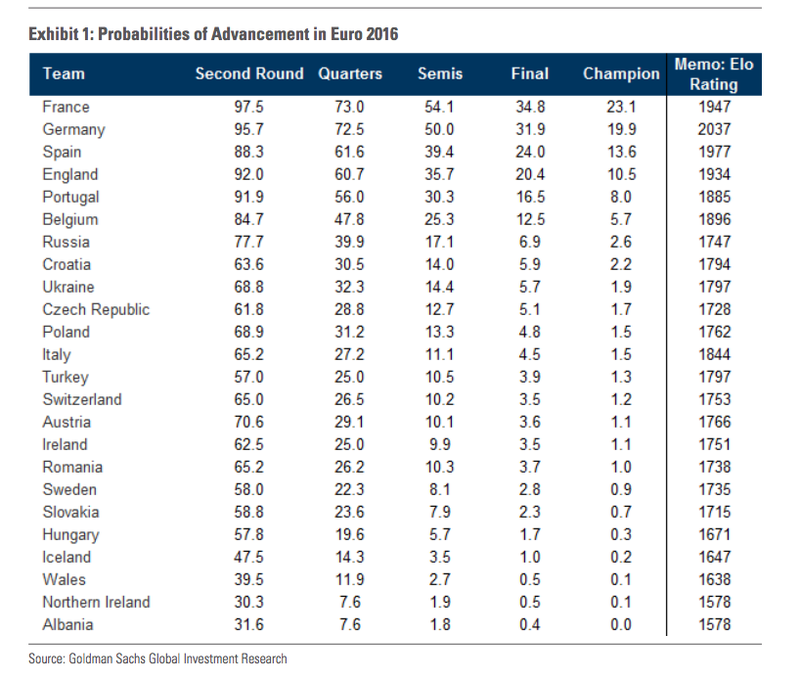 Goldman Sachs’ economic research team circulated a note over the weekend predicting the results of the UEFA European Championship, which begins on Friday night in Paris. Goldman is backing host nation France to win the tournament, saying that its models suggest the French team has a 23.1% chance of victory, compared to 19.9% for 2014 World Cup winners Germany. Coming in third place are current holders Spain, with a 13.6% chance. Perhaps a little surprisingly for British fans, England is seen as the fourth most likely to win, with a 10.5% chance of doing so. Using historical performance data for each team — most importantly the Elo rating system originally devised to rank chess players — we estimate a set of probabilities that a particular team will reach a particular round, up to and including the championship. We also provide a modal “most likely” case for how the tournament will unfold (although “most likely” does not mean “likely”). It is difficult to assess how much faith one should have in these predictions. On the plus side, our approach carefully considers the stochastic nature of the tournament using statistical methods, and we do think that the Elo rating — the most important input into our analysis — is a compelling summary of a team’s track record. On the minus side, we ignore a number of potentially important factors that are difficult to summarize statistically, including the quality of the individual players unless they are reflected in the team’s recent track record. And there is no room for human judgment (which may not be such a bad thing given that none of us are really football experts but some are enthusiastic Germany supporters). 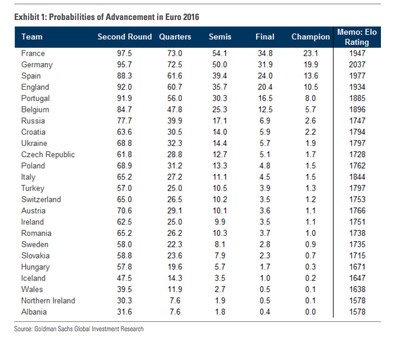 This year’s European Championship isn’t the first time Goldman has had a go at predicting a major football tournament, and in 2014 predicted that host nation Brazil would win the World Cup, giving them a 48% chance of doing so. Brazil was knocked out at the semi-final stage of the tournament, losing 7-1 to Germany in a game that shocked pretty much everyone watching. The bank’s predictions are pretty much in line with the odds being offered by bookmakers right now. Ladbrokes currently has the same four teams as the most likely winners of the tournament.